The Canadian government has finally set a date for the nation-wide legalization of cannabis: October 17, 2018. While this soon-to-be-national-holiday for cannabis users across the country is past the date the government had initially set for legalization (July 1, 2018), there is still very much a sense of scramble and panic going on behind the scenes as organizations, businesses, and even individuals work to come up with solutions for some of the very complex unknowns that this shift in legislation means for Canadians. With all these unknowns, the condo industry is certainly far from exempt. Boards, residents, and condo management companies have been hastily attempting to come up with bylaws and standards that are fair to all residents, whether or not they intend to light up once October 17th rolls around. However, in the face of uncertain and changing legislation on the matter, it’s been pretty tough going for most folks. That’s why we brought in Laurie S. Kiedrowski, partner at McLeod Law LLP, to field some common concerns, help quell some of the panic that’s been created through different sorts of media coverage, and cut through some of the confusion surrounding this hazy subject (and we promise, that’s as close as we’ll get to making a pot joke this whole blog!). 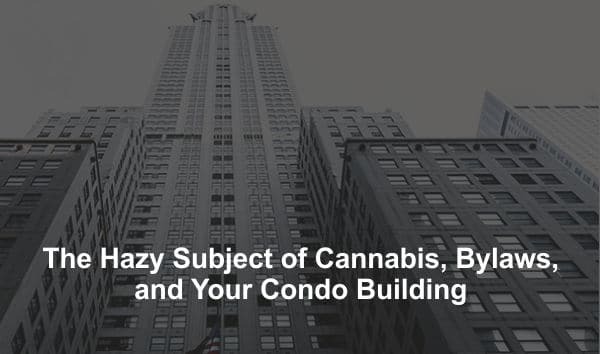 How Will Legalization Impact Your Condo Building? One thing most condo owners are worried about is how legalization will impact their building and lifestyle – and accordingly to Kiedrowski, for the most part, it probably won’t! The people who have always used cannabis, either criminally or medicinally, will still continue to use it the same way as they always have – legalization really won’t mean much to these folks one way or the other. And while legalization may encourage some folks to dabble and experiment a bit, it certainly doesn’t mean that everybody and their dad is going to be out there sparking up Cheech-and-Chong-sized joints and taking epic bong hits like they’re in college again, for exactly the same reason your upstairs neighbour isn’t doing keg-stands every evening after work – it just wouldn’t make sense! Additionally, for residents worried about smell and smoke, there are a number of popular methods of cannabis use that will likely rise to prevalence in our increasingly-health-conscious society. Based on studies of the States who have legalized cannabis, edibles and vaping will likely be the preferred methods of intake for most individuals, creating a much-less obnoxious situation for residents who would prefer to steer clear of cannabis altogether. Smoking is so passé! Should Your Board Consider New Rules or Bylaws? Bylaws should be consensus-driven. Condo corporations can basically pass any sort of bylaws they like, given that they are private entities – and as such, bylaws should constitute an agreement amongst owners. Can a condo board ban marijuana use, even after the government’s legalized it? Absolutely. Think of it along the lines of pet ownership: owning a dog is perfectly legal here in Canada, but many condo buildings don’t allow residents to own dogs because they would be disruptive to other individuals around the building. The same restrictions could easily be placed on smoking or growing cannabis, as these activities could potentially impact other residents’ quality of life. Edibles, however, are another matter, because it’s pretty tough to make a case that somebody enjoying a perfectly legal cookie or brownie in their home is causing a nuisance. What about medicinal use? This is an area in which even a building-wide bylaw against cannabis can face a reasonable challenge, as it’s obviously important that individuals be given the freedom to properly treat their various medical conditions following a doctor’s advice and prescribed therapy. However, with all the alternative methods of consumption available to medicinal cannabis users – including vaping, edibles, oils, drops, and more – you’ll be hard-pressed to find a doctor who insists that smoking is the best, healthiest form of treatment, meaning that a bylaw against smoking cannabis wouldn’t necessarily infringe upon any individual’s rights or freedoms. Is it worth the cost and hassle? This was a point that Kiedrowski came back to several times during our conversation: at the end of the day, is it worth the trouble? As she pointed out, the impact likely to be caused by cannabis legalization is shaping up to be fairly minimal. To create a new bylaw, condo legislation must pass a two-tiered test, securing a vote that includes 7500 unit factors and is agreed upon by 75% of owners (not units) to be ratified. Considering how minimally Kiedrowski expects cannabis legalization to impact Canadian condo buildings, she recommends taking a light touch with bylaw legislation, and points out that if things DO end up being a problem, there’s plenty of time to introduce new bylaws in the weeks and months following legalization – at which point you’ll probably have more buy-in from your condo community anyway, if there is a real issue to contend with. The big point Kiedrowski wanted to leave us with today is that nothing related to legalization is worth panicking about. Will there be growing pains that accompany the legalization of cannabis in Canada? Absolutely – but there will also be plenty of time to deal with any issues that crop up in a responsible, reasonable manner. Just take things coolly and cautiously, for now, she advises, and roll with the punches – it will save you plenty of headaches down the road! Before we sign off, we want to thank Laurie Kiedrowski from McLeod Law LLP for joining us today and casting some light on this complex and nuanced issue – her knowledge and insight on the subject is very much appreciated! If you’ve got additional questions about what legalization could mean for your building or what you should be doing to prepare, don’t hesitate to reach out to us here at Catalyst Condo Management – we’ll field your questions and do our best to help make sure you and your condo are in great shape to handle anything come October 17!